Wavelengths aren’t confined to the world of physics. To enjoy true success in the saddle, it takes two . . . riding in unity, reading each other’s thoughts. The Stampede held its 13th annual Invitational 4-H Rodeo, sponsored by Westcan Bulk Transport and Lammle’s Western Wear and Tack, over the weekend – with more than 100 youngsters, aged 9 through 20 and representing thirty 4-H clubs from across Alberta, congregating at Stampede Park for the two-day event. For many, the Stampede’s annual youth invitational affair is an entry point into the world of rodeo, and these young cowboys and cowgirls tested their chops with both timed events (barrel racing, pole bending, and thread-the-needle) and roughstock events (breakaway roping, goat tying, and cow riding). 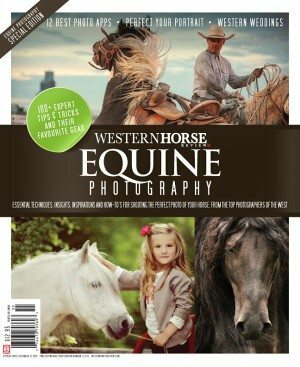 In recent years, education has become an increasingly important aspect of the Stampede’s 4-H Rodeo, and this past weekend’s event featured an intriguing Saturday-morning seminar on the subject of horse harmony — a “horse personalities” clinic by Dessa Hockley of Millarville, Alta., author of the book Is Your Horse a Rock Star? 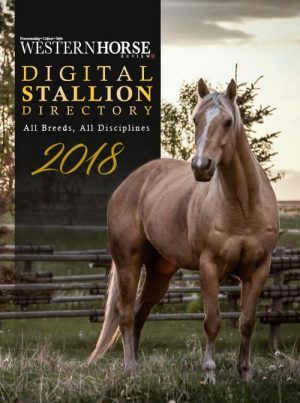 So what about these horses down at Stampede Park? What about their personality types? Were they rock stars? Accountants? Wallflowers? Macho men? 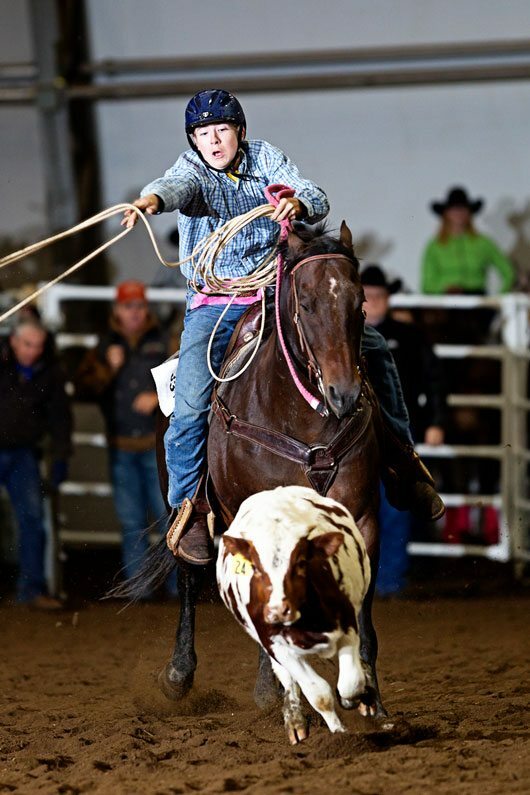 “He’s a reluctant rock star,” said Wrubleski of Beau, a 16-year-old quarter-horse gelding owned by his sister, who carried him to the senior breakaway roping championship, for contestants aged 15 through 20, in 6.1 seconds. “He’s nice and laid back, and when he has to get to the punch line, to get something done, he has the get-up-and-go to do it, which really helped today. 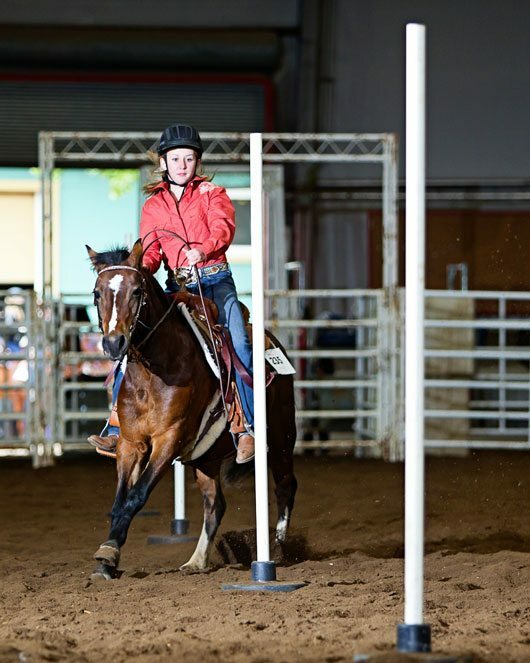 Laramie Hlus, 16, of Innisfree, Alta., captured the senior pole-bending event — head-to-head runs involving slalom racing and straight-out speed — on Saturday aboard Joe, an 11-year-old quarter-horse gelding formerly ridden by her mom, in a time of 19.24 seconds. The 13th annual Stampede 4-H Rodeo also offered seminars in goat tying by Lindsay Miller, biosecurity by Dr. Ted Shacklady, sports medicine by Mark Barrett, cow riding by Dave Shields, calf roping by Shawn Miller, and horsemanship for barrel racers by Suzanne Randle DePaoli of Longview, Alta. 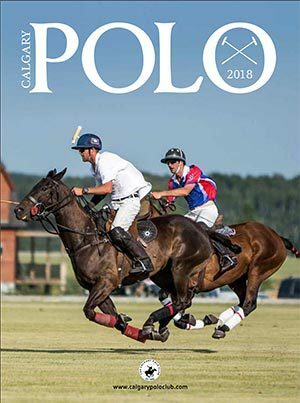 In Saturday’s senior thread-the-needle event — negotiating a tight corridor, circumscribing a pole at the end of the course, and returning down the same corridor — Calgary’s Anna Gunn and Rosie emerged victorious in a time of 7.55 seconds. 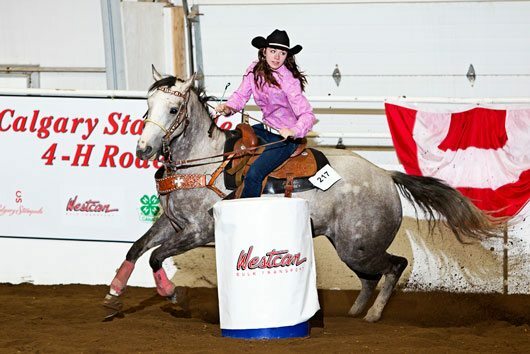 Desirae Jackson of Sundre teamed up with Casper to win the intermediate division, for competitors aged 12 through 14, in 7.71 seconds, while Airdrie’s Logan Berreth won the junior title (ages 9 to 11) aboard Fargo in 9.15. Also Saturday, Kimberly Tammaro of De Winton won her second straight senior barrel-racing title on Cherish in 14.61 seconds. 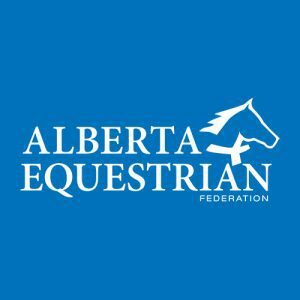 Fallon Jenkins of Ponoka and Casey were intermediate champs in 15.1, while Saige Jackson of Sundre and Nugget claimed the junior division in 15.24. Nicole Lausen of Carseland won intermediate pole-bending aboard Freebie in 20.35, and Taylor Drake of Kathyrn rode Docs Nanking Dodger to victory in junior poles in 21.11. On Sunday, Amarie White of Consort and Skip & Kraimer teamed up to win senior goat tying in 13.67 seconds, while Kelsey Hallett of Big Valley won the intermediate division aboard Missy in 10.85. 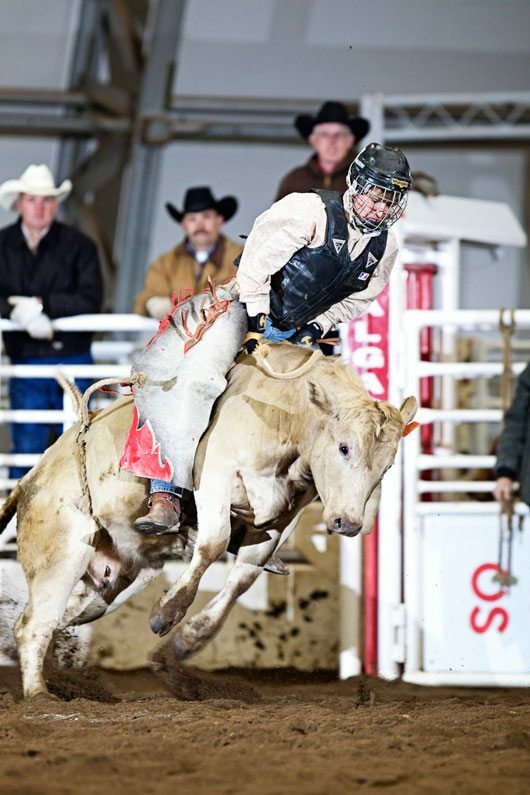 Calgary’s Jordan Mitchell claimed senior cow riding with an 80-point ride; Laramie’s brother Bailey Hlus of Innisfree was intermediate champ, also scoring 80 points. Tye Werk of Bowden emerged as intermediate breakaway roping champ on Busch, stopping the clock in 3.16 seconds.